Whenever we talk about the First World War, we tend to equate the conflict with the European battlefields. Now while most of the encounters did take place on European soil, the contribution of Asian and African countries are often overlooked – mostly due to lack of research done on the part of contemporary historians. 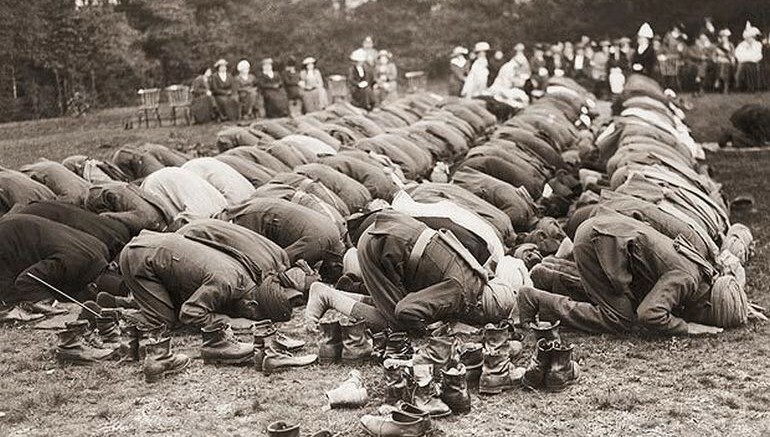 Well this time around, Islam Issa, a lecturer in English Literature at Birmingham City University, had decided to make an exhibition on the subject of Muslim contribution to the war effort between 1914 to 1918. And his preceding research has provided some eye-opening figures on the matter, with an estimation that around 885,000 Muslim soldiers took part in WW1. To put things into perspective, this is more than double the number previously thought. Interestingly, this previously acknowledged figure of around 400,000 Muslims who apparently served in the First World War, was based on the religious denomination of some of the Indian troops who took part in the great conflict. But Issa has suggested that additional troops from Arab countries and North African nations also supplemented the British and French cause. According to him – “Egypt alone contributed at least 150,000 camel drivers for British campaigns, and the other north African countries helped the French with at least 280,000 men”. His estimation comes after analyzing a wealth of historic archives, contemporary censuses along with assessment of personal stuff like diaries and letters. In fact, if these numbers are taken at face value, the figure accounts for a whopping 20 percent of all recruits derived from the erstwhile British Empire. The Muslim soldiers, like their colleagues, did serve in various capacities, ranging from front-line soldiers, builders of makeshift trenches to transporters of crucial goods across supply lines. And balefully like other troops, around 89,000 Muslim soldiers met their deaths in what had been touted as the ‘Great War’. Intriguingly enough, Issa has also talked about how in a general sense, India’s contribution to WW1 has often been overlooked. Now according to the research figures provided by him, around an astronomical 1.5 million Indians fought alongside the British soldiers, while India as a nation supplied 3.7 million tons of commodities and 170,000 animals – all being shipped to support the war effort. When translated to a financial scope, India provided around 479 million pounds ($682 million), or 20 billion pounds ($28.5 billion) with inflation adjusted. I think the numbers in this research are probably understated; they represent a minimum that we can be sure about, but it could potentially be quite a bit higher. But he also added that beyond just objective figures, it was the personal side of the tragedy of WW1 that drove him to make an exhibition that is dedicated to the Islamic contribution to the conflict.